How do I set up Grade Point Scales and Marking Grade Sets? In order to set up your assessment framework, you need to first create grade point scales and grade sets. You can do this by going to Students > Assessments > Assessment framework > Grade Sets. A Grade Point Scale is what is used to mark your assessments, you can choose the number of steps in-between each grade. An example of a simple grade point scale could be Years 1-6 Emerging, Developing, Secure. If you wanted 1 step of progress between each grade that would give you a grade point scale of 18 (3 points of progress available per year group). To select a Grade Point Scale, click the drop-down menu. Here you can then see all the Grade Sets in the Grade Point Scale. To set up a new Grade point scale, click the green Create New Grade Point Scale button. Enter the details. You automatically get the option to add a Marking Grade Set, here you need to select Close. In the section called Display Grade Set, select +Add. Add the details needed for the Display Grade Set, and select save. You can edit these details later if you want. You can then use these grade sets when setting up a new assessment. If you do decide to add a marking grade set, you can specify a 'grade value' for each grade. The grade value is the midpoint value which then informs the 'grade range' e.g. if a grade has a value of 4 the range would be 3.5 - 4.5. Please note that before you add all year groups to an assessment, you need to work out if all years will take the same assessment. For example, if Years 1-6 will have the same Maths assessment or a different one. If the test sat by a Y1, is the same as Y6, then it should be one assessment as you would expect the children to move from a low mark to a high mark throughout KS1 and KS2. If it is a different test per year group or KS, you would expect children to stay at the same level each year, i.e. around 90 marks throughout and for this you would set up an assessment per year group, KS or group of assessments. 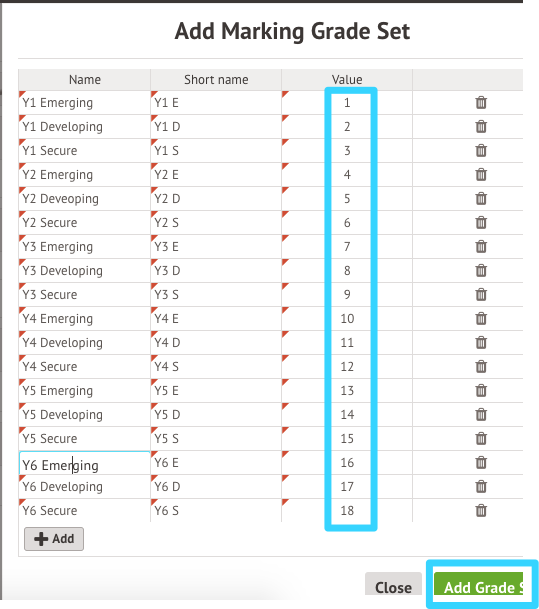 To amend a grade set for the Grade Point Scale or view the numerical values with each grade, click on the grade set and click the orange Edit button.